While many beginners start out with recreational skating, many eventually want to move up to competitive skating. One of the most popular forms of competitive skating is the roller derby. High-level professionals tend to prepare themselves and their skates all year round for derby season, but chances are that those starting to try out the derby circuit would not have that level of dedication or budget. In fact, chances are that you may find yourself covering multiple bases to ensure that even if you don’t stick with derby, you at least have a pair that will stay with you for some time to come. However, choose too weak or flimsy a pair and you won’t even make the cut at try-outs. 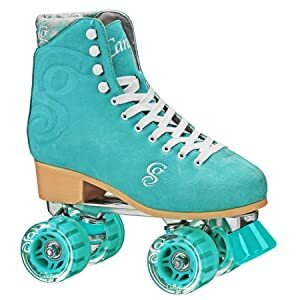 Keeping all this in mind, we have come up with the following points for anyone wondering how to choose the best roller derby skates without breaking the bank. a. The nature of the derby – Most of the time, you would be able to learn from derby veterans what sort of surfaces to expect in the derby you’re about to participate in. if the surface is slippery, go for softer wheels (lower durometer), while if they are too grippy, choose higher durometer, harder wheels. b. Your height and weight – Generally, the heavier you are, the harder your wheels should be. This ensures that your weight does not cause too much friction with the surface and thus slow you down. Height is trickier. If you’re lower than 5’3”, you should choose wheels that have the width not more than 38mm and height not more than 54mm. At the other end, unless you’re exceptionally tall (or heavy), you should not go for wheels having more than 44mm width and 70mm height. c. Style of skating – Do you prefer more agility and speed, or want to have moderate speed with greater ability to turn quickly? As a rule of thumb, a higher truck angle will allow you to move faster, while a lower truck angle will give more directional control. Plates, on the other hand, are less confusing. If you’re just planning to try out Derby with no plans on sticking with it, nylon plates will work just fine. If you want to go for the long haul though, you should consider aluminium plates, though they are costlier. Ask any Derby veteran and you’ll be informed that getting a good ABEC rating on your bearings is a must if you want to stay in the game. ABEC-5 and above are generally considered good for Derby, though you can settle for a lower rating if you are planning for the short term. However, the ABEC rating does not really affect your ability to move faster or farther every time you stretch those muscles. This is really determined by the overall quality of the bearings, which in manufacturing jargon is called “roll-out”. Unfortunately, the relative roll-out of the bearings on the skate isn’t something the average manufacturer is likely to advertise. In our experience, Powell’s bearings are some of the best around, but they aren’t the only ones in the market that you can trust. Top-level derby participants swear by leather boots. One reason for this is that leather tends to stretch, allowing players to “break-in” their boots to achieve the best level of comfort. Leather, however, is expensive and faux leather (or leatherette) doesn’t provide this benefit. If you’re on a tight budget and can’t afford genuine leather, you can compromise by getting one size larger than your own shoe size. Before you do that though, borrow a pair from a friend with a similar shoe size and try it out to ensure that you get a snug fit. The lace system is increasingly being challenged by velcro straps. Some derbies have their specific rules regarding the type of shoe you’re supposed to use, but if yours doesn’t, going for the velcro straps may save you precious time before and during the derby. Pro level skates are often custom made and can cost upward of $500 a pair. Veterans who make do with mass market units also don’t use skates below the $400 mark. However, needless to say, these levels are unrealistic, especially if you aren’t planning on making a living from skating. For this reason, most derby greenhorns prefer the $150-$200 price bracket for their skates. Going above to the $300 bracket is ideal if you want genuine leather and high quality bearings and aluminium plates. Going lower, however, will result in your skates becoming highly unpredictable as the derby progresses and may give up on you after a year or so. 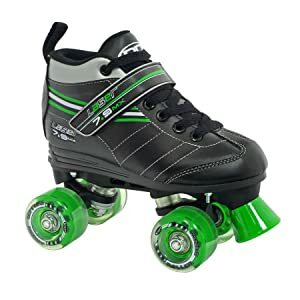 Keeping these in mind, go for skates that fit your usage and skill profile, ensuring that you don’t choose anything too specialized as these may not be ideal for regular recreational skating later on.